Are You “Retirement Free?” Check Out This Calculator! You know how we’re always wanting more money no matter how much we already have? Or how we’re always getting impatient with ourselves, even though we know we’re doing okay and it just takes a gazillion years to get to financial freedom? Well, I just stumbled across this BRILLIANT idea by Chris at KeepingThrifty.com and it’s totally helping me to *appreciate* my money more. He dubbed it “Retirement Freedom“, and in a nutshell it’s a quick way to tell if you can retire at a normal age based on how much you’ve already saved up to this point. In other words, if you never invested another penny again, could you retire safely by the time you’re 65 years old? And if not, how much more would you need – either time or investments? 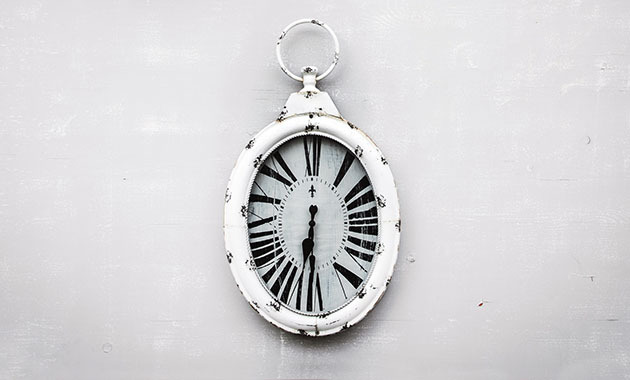 Time is always > than money. So, how do you determine if you’ve hit Retirement Freedom or not? There’s a spreadsheet for that. You can grab it here or by clicking through Chris’ blog, and after a few short entries it’ll pop you out your status, complete with nerdy graph and all. And here’s the best part – for all the new people starting out their journeys, as long as you have $1.00 or more invested it’ll extrapolate it over the years and show you just how much an effect it’ll have, even if you’re miles from hitting “Retirement Freedom.” All money invested grows exponentially. Fill it out and see where you land! It’s been a few days now since first coming across this, and I really can’t understate the amount it’s shifted my thinking so far. I do my best to be appreciative and try to envision a great future, but I’ll be the first to admit that I need to be shocked into reality sometimes. And this is certainly doing the trick. Glad to hear you liked the tool – sounds like you’re in a good spot! Wow, your lead paragraph hit my mood lately right on the head. I just found out that, even with all of the new workload that I’ve taken on at work, I was only given a 2% pay raise this year. feeling very underappreciated and entitled to more since the person that I took over for was making considerably more than I am and was doing even less. Sorry for the rant but I’ve been working hard as a sole breadwinner (the only one in this department by-the-way) and I’m starting to realize that the only way to get closer to retirement is to leave my job that I’ve become so accustomed to over the past few years because they offer no growth potential here. I look forward to checking out this calculator and seeing what my results are. Thanks for the info J. and Chris. Sorry to hear about your work situation – that’s rough! I’m also the sole breadwinner and I know how that shapes my mentality when it comes to work and career options. Hope you get some good news from checking out the calculator! After entering in my info on the calc I came up with a freedom date of 11/30/2029, shortly after turning 42. I also used a conservative 6% growth rate to be safe. I hear ya, man :( Wishing you nothing but good vibes and success over here! The calculator shows that 100 years from now I’ll retire with $1.47 Billion!!!! That is my new retirement date. 2/28/2117. YES!!! Nice! Better late than never, right? I look at this in a similar way. I read a lot of business news and they talk about the amount you should save by x age to safely retire at 65. (I didn’t have the calculator, though it’s nifty and will check it out). When I look at the numbers for my age they are not even in he same building either as a x expenses, x income, or raw number. That reminds me any question of my financial health is largely one of buying more options not basic survival. That’s extremely reassuring. I really like this comment – once we’re past a certain threshold, you’re totally right; I find myself treating finances as life and death but the reality is that I’m in a position where it’s really unlikely they’ll actually be anything close to that. Great tool! This is modeling a daydream of mine. I’m hoping to work a couple more years and then go part time. That would really cut our income and ability to save but would give me more freedom while my kids are young. And according to this we’d still be able to retire in our mid/late 50s even if we never contributed another penny! I put in that I will need $50K in today’s dollars, put me at $2.6m. I also used a lower rate of return. the calc says 8% I say pessimistically 5%, so I averaged them and put in 6.5%. At that rate I need to contribute for 10 more years to reach Retirement Independence. At 8% it was just under 8 years, at 5% it was 16. Either way, worst case that would put me at just into my low 50s. Still not terrible, best case would be mid to low 40s. Either way I still have to save enough in a regular investment fund to bridge the gap between official retirement and the day I turn 59.5…. it is an option. Plus I omitted my HSA in that analysis too. Hopefully we will be able to bump it to $14k soon, that would provide a huge bump for me. Awesome – sounds like you’re in a pretty good place even in the conservative scenario. J$ hit it on the head with the conversion ladder – though there’s rumors about a push to get that closed in congress. Hopefully for us FIRE-targeted folks that doesn’t come true! Wow – I’m really honored J$ – thanks so much for sharing the Retirement Freedom idea here. I’m excited to hear that this is doing exactly what I hoped – giving people an intermediate target and some peace of mind. It’s really liberating to know that your senior years should be covered – that you just have to focus on enjoying and thriving in the present! I don’t have kids, but I’ve always thought about this. Wouldn’t it be cool if all 18 year olds knew that they were set for retirement and they could focus on work that was fulfilling, meaningful, valuable to others, etc… ? Totally with you – if we were going to do this for our kids, we’d definitely plan on keeping this under wraps until they were old enough to really appreciate it and use it to let them follow their passions and make a dent in the universe (instead of just slacking off banking on this being there). Great calculator. Looks like I wont hit retirement freedom until age 57 (need $8.9M). Don’t get me wrong, i’d be happy to retire at age 57 but who knows what the future will hold as respects my finances and my ability to save. These days were able to max out our 401k’s and still save a couple grand a month in a Fidelity account. That said, we’re having twins this summer and i’m sure having 3 children will be a big hit on our finances, at least for the next few years. I have no problem cutting back our lifestyle and dipping into our more liquid savings, but have told myself that the last things to go will be our children’s 529’s and then our 401k’s. I’d be okay not taking a vacation for the next few years and eating ramen and hot dogs every day but want to be sure i’m still saving for the future where possible. You can always borrow money to pay for school, you cant borrow money to pay for retirement. Sadly I have many colleagues in their 50s and 60s who have told me they’ll have to work until they’re physically unable too. They simply haven’t saved enough for retirement and expect to work into their 70s to be able to have any sense of a nest egg. As a dad of three (including twins), I can say that yes – your finances will get a bit tighter in the next few years. It’ll be crazy but you’ll have a ton of fun. We’ve got a 6-year old and twin 4-year-olds right now. If you ever want to chat with someone who’s been there, shoot me an e-mail! Loved the calculator – I’m “already there”! Thanks for developing it, Chris! :) It’s exciting to see that all the hard work over the years has paid off. The other great thing I’ve realized is that, even if we stopped contributing now, we could still retire early. Which means, if we could bring in enough money to cover living expenses, my husband could walk away from the 9-5 sooner than we thought. Thanks Amanda – glad to hear you liked it and congrats on being “already there”! It’s awesome to know you’ve got the career freedom to do something a little less crazy as long as your expenses are covered! That’s a pretty cool tool. I’ve done calculations in the past to see where we end of if we never contribute another dollar to our retirement accounts again. It’s pretty comforting to know you’ll have a multi million dollar portfolio by the time you reach social security age even if you never did anything further. I’m with you – makes me feel comfortable pretending that social security isn’t even there. Knowing I won’t be dependent on it because I’ve got enough buffer in my retirement savings is a really nice relief. Great spreadsheet. I’m making a copy and adding to the others I use. Thanks you sharing J$ and Chris for putting this together. Looks like I could be doing a little better. If I want to leave work before 65. Also. for the folks who are more cautious about the 4% rule, maybe add another field with the desired withdrawal rate. Right now it’s hard-coded at 4%SWR (25x spending). I would shoot for 3.25% or maybe 3.5% just to be sure. Great tool! Keep up the good work! Haha. The problem of too much money… Not the worst problem to have! Awesome suggestions – I’ll have to see about putting those in there! Ok – these ideas were too good to wait on. I went and updated the sheet to put those in. Really cool to see the impact of changes in your SWR and knowing how small that balance really is at the time of retirement freedom is just an awesome reminder of the power of compounding. Thanks again for the awesome suggestions! Wow, you KNOW it’s good when it gets the “I don’t care about money” wife’s attention! Really cool spreadsheet by Chris @ KeepThrifty, great tool for the toolbox. Great post! Ahh, thanks for the calculator! I really want to retire at the ripe ol’ age of 35, but this is a neat principle to explore! I need to plug in the numbers, but we wouldn’t be all right to retire at 65 if we stopped investing now. We’re only investing in a Roth IRA and a 401k at the moment, and if we paused our contributions I’m not sure if we’d be able to live on them, after accounting for inflation. We’re trying to eliminate debt first before we can heavily invest extra moolah. Nice calculator! On the financial independence forums on reddit this number is called the ‘coast number’ or ‘barista number’ i.e. when you hit this number you can coast to retirement, or you can get a low-paying job that allows you to live but not to save any more. The feeling of security when you hit your coast number is very satisfying. I’ve seen both descriptors for this number, too. I prefer “coast-FI”, because I just love that it simultaneously evokes the “coasting to retirement” meaning and the image of actually just spending your time on the coast working a surf shop until it’s time to truly retire. Which becomes a valid option! That’s awesome – I like those. I kinda figured I wasn’t the first one to come up with the concept but I wasn’t able to find anything on it out there. Cool validation to see others out there thinking the same way! I’m a little behind all y’all, with about $18,000 in my retirement account in 30 years if I stop contributing now. So I will keep contributing and/or working forever. Luckily I like my job. At first that was depressing — my Retirement Freedom isn’t until 2034 which feels so far away! But then I realized I’d be 47 which is still pretty great by today’s standards. Plus, I haven’t been able to max out my 401k yet so there’s room to increase my monthly contribution. The calculator also doesn’t take into account my employer match or my non-retirement accounts so I’m feeling good. Thanks for creating & sharing, guys! I remember seeing this and immediately checked my numbers and given my young age (26), I figured out I would only need another 25k to retire at 65 at this point. My more skittish partner who’s got 9 years on me but also a larger amount invested is already good to go which is a great relief for him as I don’t believe he quite believes my retirement plans yet. The most important thing this highlights is how our daily expenses dictate when we can retire. 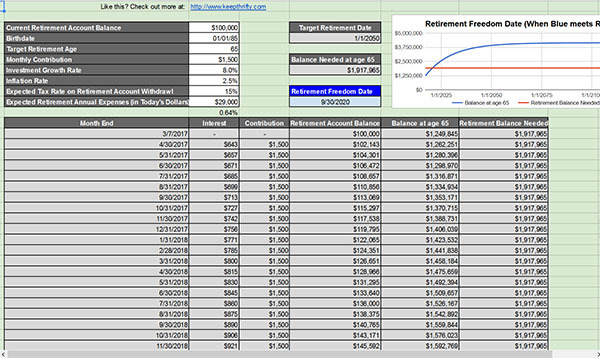 If I can get by on 30k, I’m already set to retire at 62; If I “need” 50k/year then not only do I have to work longer, but I won’t hit the retirement freedom date for another almost 20 years! Just filled it out and it really is an awesome tool. I find it oddly calming to know I could just spend every penny we make from now until retirement age, and be fine…and that’s without even counting on Social Security! Very cool. Looks like if we don’t contribute anything as of today we’ll be fine retiring at age 65. In fact we can actually retire at age 60 if we don’t contribute anything moving forward. Ahead of the game that’s for sure. If we then add the non-tax sheltered amounts which we plan to utilize in retirement we’re way ahead of the game. We’re farther along than we thought we were. We would only need until 2022 to meet our number at age 65. Of course we’re going for earlier than that but very cool either way! Pretty cool tool! Looks like I’ve already met my retirement freedom goal! Great job developing the tool, Chris! It was very interesting to see what formulas you used for the tool and the match behind it. Ok J. You’ver really have outdone yourself with this post. Absoultely fantastic tool Simple elegant and highly accurate. I mean, spot on accurate within a Grand. Not only can this work for retirement, it can work with any type of long term saving goal, like saving for the kids college costs. (too late for me.) Anyway, you provided a brilliant executive summary and introduced me to another valuable resource keepthrifty.com/. This tool is so good, that I posted it on linkedin to my very small clutch of followers, some of which already appreciated the effects of the FIRE Calc. Thanks again for having online coffee with me every mornng! J$, thanks for sharing! Chris, what an AWESOME spreadsheet!!! You’re welcome – congrats on already being there! This is such a useful tool. Thanks for sharing it. I’m late to this discussion, I know. The one problem I have with this calculator is it never factors down markets… While eventually the market does go up, downturns (regardless of the duration or depth) mean the investor still has to recoup that money before resuming an upward momentum again. That, in turn, increases the amount of time one needs to achieve FI. Yes, more contributions could be made, but that is not always possible — even when being very frugal. Thoughts? It allows you to adjust the rate of return if you want to be more conservative :) But it’s all really a guestimate since no one knows for certain what the future will hold, even though you can probably come close to long-term averages (which is why everyone often quotes 7% or 8% for market gains). Next post: My Accidental Side Hustle: Making Frozen Meals!